The decaying building standing next to its grand and worldly big brother acts as a symbolic measure of the political and economic rise and fall of the region more widely. A peeling, blackened window vinyl on the front of the old terminal welcomes you to Cork – European Capital of Culture 2005, it’s a haunting reminder of better times, still fresh in the memory as Ireland struggles to recover it’s economic stability. 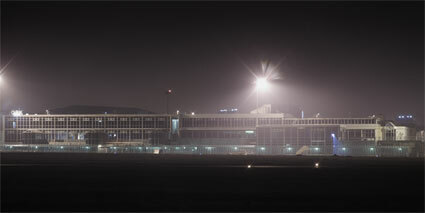 The new terminal, unlike many of the new and half built houses that litter the surrounding countryside, is now occupied and in full operation. With this backdrop, the symposium, held at Gate 5 of the old departure lounge, was directed at examining the commodity culture of contemporary art, the global art market and challenging what was termed the bland ubiquity of ‘Airport Art’. Seeking to propose the alternatives was a group of theorists, curators and thinkers, including George Yudice, Annie Fletcher and Charles Esche. The discussions wallowed in reasoned if fluffy rhetoric on the persistent debates around the role of the museum and the art market, interspersed by the periodic interruption of an airliner landing or taking off. One of the most vital, pertinent and forthright contributions to emerge out of the symposium was Steven Wright’s presentation on, among other things, notions of Usership, ‘useful art’ and remuneration. Grounded in practical examples of emerging activity Wright (Professor of Art History at the European School of Visual Arts), outlined a project he co-organized titled Plausible Artworlds, a weekly Skype presentation and open meeting introducing alterative creative practice models. The program highlighted activities such as the somewhat secretive online pirate library and reading room AAAARG.org, the Free Art License, that ‘grants the right to freely copy, distribute, and transform creative works without infringing the author's rights’ and At Work / Au Travail, a brilliant loose knit community of global artists and workers who utilize their everyday employment as a stealth form of artistic production. Outside of the symposium, the exhibition was striking in its incidental appropriation of space and the subtly of display within the building. Noticeable in its indiscernibly, the curator Peter Gorschlüter (Deputy Director of MMK Museum für Moderne Kunst, Frankfurt am Main) described his intentions as ‘turning decay and absence into prospect and presence, the exhibition wakens the decommissioned terminal building to become, for a short moment in time, both an autonomous place and a place where autonomy is negotiated.’ The ethereal curatorial strategy permeates the works throughout the building, playing to the strengths of its infrastructure but also allowing space for the retrograde experience of those encountering the terminal. 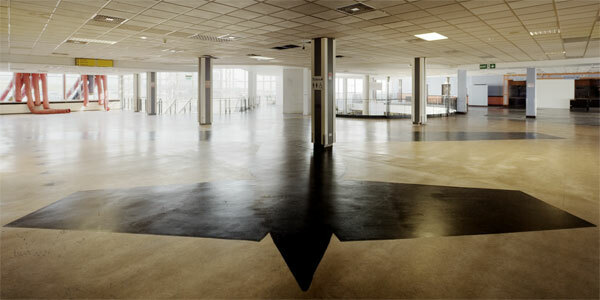 In this manner, Le Pavillon, an artists’ group from the Palais de Tokyo, provided an audio back drop to the space, TO NAME A DAY, distributed through the PA system of the building and Frédéric Pradeau attempted to raise the air pressure in the building, by pumping in air through a mass of industrial ducts with Under Pressure (2011). 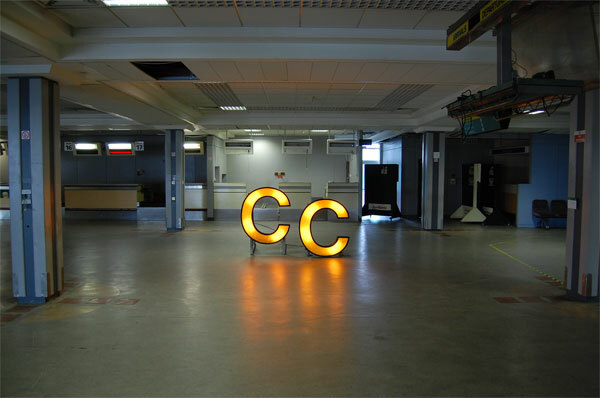 While subtle, the exhibition was remarkable in its tendency towards the monumental and memorial, seen in Shane Munro’s relocation of two giant C’s, from the airport title signage lettering on the roof to the check-in desks and Imogen Stidworthy re-appropriation of three giant advertising light boxes. 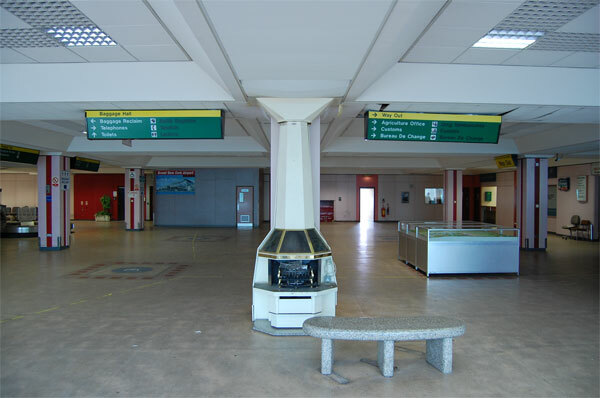 These boxes were located in the baggage reclaim area, one propped on its side, displaying the image of a grand single brick enlarged to stretch from floor to ceiling, another with what appeared to be a satellite image of a demolition site and the third light box was left bare with only the inner florescent tubes visible. The accompanying spoken dialogue, with extracts from W. G. Sebald’s The Rings of Saturn, left a prominent impact and moving, disquieting sentiment for histories unknown. Shamus Nolan created a shadow-like outline of a small passenger aircraft painted on the floor. 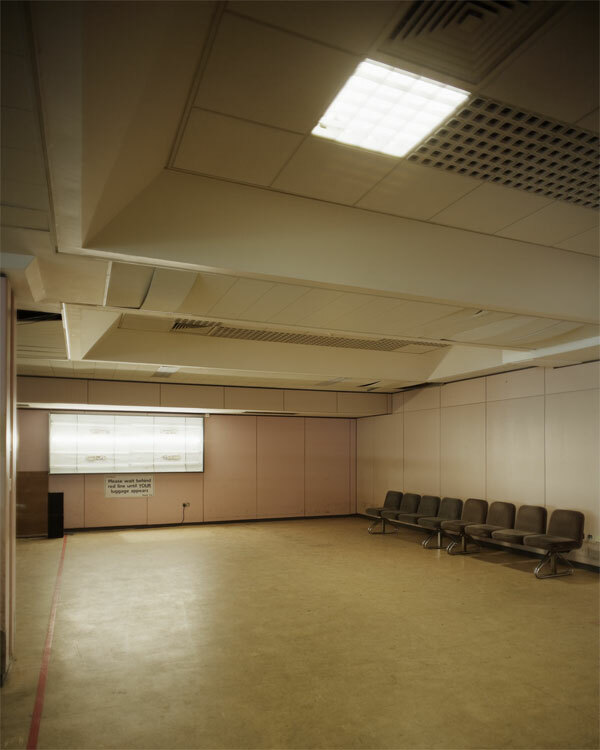 The representation powerfully resonated through the space given that there was a recent tragic air crash at Cork Airport in which 6 people died just a month before the exhibition. Before the crash, Nolan had intended to stage a cunning intervention in day-to-day airline operations by buying all the seats on a plane that by coincidence turned out to be on the same route, but on a different day as the flight that later crashed. The airline subsequently cancelled the route and the project didn’t go ahead, but the artist still painted the outline of the plane on the floor as he had originally intended The fate and grace of this unintended monument left a stark, and somewhat bitter taste with many of those who encountered it. 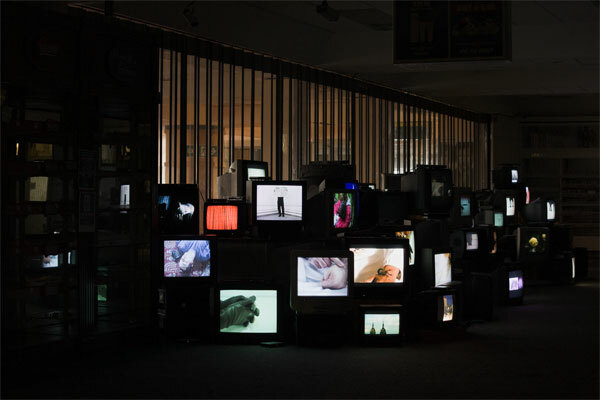 Douglas Gordon placed his installation of almost every work he has created since 1992 in the defunct duty free shop. An assembled mass of buzzing, flickering cathode rays, nearly a hundred, ‘old’ tv sets were perched on shop counters and beer crates. The work acted in its own right as a giant monument to obsolescence with TVs salvaged from the homes of local residents by way of an online appeal and intercepted from scrap merchants who were sending them to Nigeria on a container ship. The simultaneously running works, some seeping sound, others silent, created a monotonous mélange. But perhaps the audio was fitting for the way a weary traveler with a short attention span might trawl the duty free for entertainment while waiting for a flight. The audience of the work were perusing Gordon’s back catalog as they would perfumes, Toblerones and sunglasses, although to survey a body of work in this way does provide an enlightening snap shot of the artists’ concerns. The exhibition follows the in-vogue exoticism for obsolete, abandoned and decaying buildings that pervades contemporary art at present – as a vision on to a recent social past and a monument to change and economic boom and bust. One of the challenging functions of situating any artwork in spaces as imbued with particularities as this, is whether it finds a place within the building to compliment, distract, critique or transect. Where it succeeds is as opportunity to play with an airport as an emotional territory, fraught with the counterbalance of the fear and joy inherent in arrival and departure. 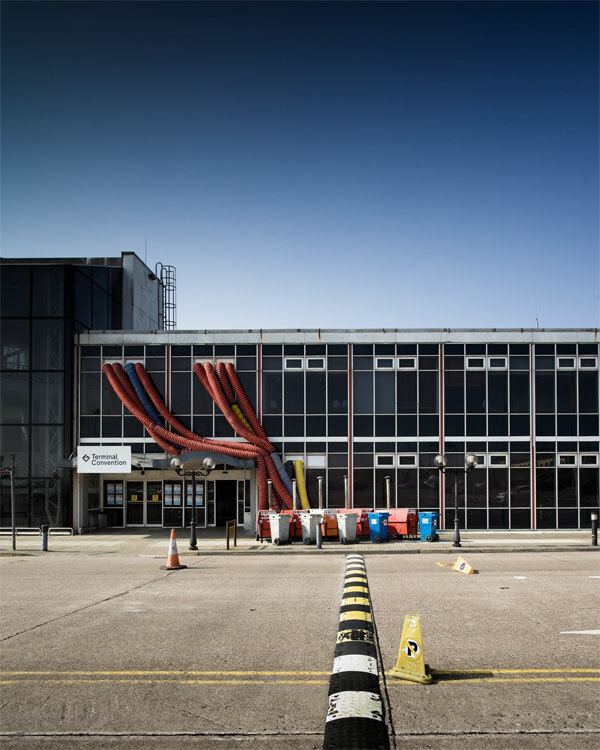 For many of Cork’s residents the opening of the old terminal was simply an opportunity for a small historical pleasure ride into their personal past, many having grown up traveling through the once automatic doors of the terminal.